Mad magazine don't need an introduction. 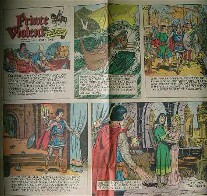 In july 1954 (nr 13) they made an 8 page parody of our Prince, Prince Violent. Later they did reprint this in the annual issue (1961): "The worsed from mad". In 1988 they did reprint Prince Violent in the "Mad, Tales Calculated" serie (volume nr 5). The picture that is displayed is the top-left part of the book-cover...it's a tiny picture (about 3x5 cm), the rest of the bookcover is plain red. The value of the Worst from Mad in Euro 30, the Tales calculated is 10 Euro's.